As a result, it is important to know how a hide is measured, as that affects the overall size and shape of the panels. Take, for example, the American crocodile skin: in this blog, we’ll highlight the overall size of the American crocodile’s hide, how that measurement is taken, and what the different grades of skin indicate. How Big is American Crocodile Skin, and How Is It Measured? American crocodiles are one of the larger crocodilian species (though not the biggest), with adults hitting an average length ranging between 3.8 and 4.5 meters. However, when measuring an American crocodile skin, it’s not the length of the hide that’s typically measured, but the width of the belly at its widest point. When measured by belly width, American crocodile skins can vary from 35 cm wide to 75 cm wide—but, the majority of available skins will be around the 50-69 cm range. Depending on the overall size of the American crocodile in question, the hide may have between 25 and 34 rows of belly scales, with 14-16 scales per row. As a rule, wider American crocodile skins also tend to be longer relative to other crocodile species, meaning they’ll have more belly scale rows for you to work with. What Are the Different Grades of American Crocodile Leather? Grade 1. These are the “pristine” or “flawless” skins that have no defects in the belly. Grade 2. These skins might have a solitary defect or small cluster of defects on the outer edge of the belly—these are usually easy to work around. Grade 3. There may be a defect or a small cluster of defects in or near the center of the belly, which may be somewhat difficult to work around (depending on the application). Grade 4. Here, there are defects present in more than a single quadrant of the belly. Naturally, the worse the grade and the smaller the size, the less expensive the American crocodile skin will be. When shopping for exotic leather, it’s important to consider your application and how easy it will be to work around any defects in the hide. Crocodile skin is expensive, so you want to make sure you get the most out of your skin. Handbags typically require the best grades, followed by garments and upholstery, then footwear, and finally belts and smaller leather goods. The ideal size for your project depends on the size of your panels, how much seaming you are comfortable with both technically and aesthetically, and also the scale size with which you are comfortable. For example, you probably don’t want huge scales on a small card case. 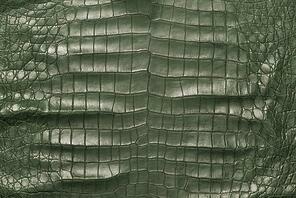 Need help finding the perfect alligator skin or crocodile skin for your needs? Contact the exotic leather experts at Pan American Leathers today!